I have so many projects I want to work on and get finished. I have made quite a list of UFO's and just love crossing them off. So many projects, so little time. I believe I have mentioned that I have plans to retire from a job that I have had for 28 years. I love the work that I have been a part of for so many years and I know that I will miss it but I also know it is time to make a big change in my life. With the change in my work life, I hope to do more sewing, gardening, reading and best of all spending time with the people God has brought into my life. That would include family, church friends, neighbors, blogging friends and the people I have yet to meet. With the flooding we had this winter in our home, the first thing I will try to accomplish is putting our space back together and with that do a little more purging and organizing. Below is a picture of one of the 20 plus projects waiting for completion. This is the project I chose as my March goal. I have done a bit of work already and can't wait to finish and share this with a sweet little girl I know. This is my Schnibbles - Bungalow quilt. I am planning to quilt it myself using a quilt as you go method and I will be adding Minky to the back. I will be linking up at Elm Street Quilts sharing my March goal. Happy Sewing to those of you who love it and Happy March to all. This has been a month of cold and snow in the Pacific Northwest. I do enjoy a bit of snow but my work involves driving vehicles all over two counties providing library service to those who cannot get to the library. The unusual amount of snow in our area resulted in a couple of closure days and short open hours for our libraries, many closed days for our local schools. The snow added to the beauty around us, I took a couple of pictures while driving around Lake Stevens. With a couple of snow days that kept us all home from work and school, I was able to complete the blocks for my quilt. It is now ready to send out to have it quilted. It is a fun quilt and I am tempted to make it a permanent home here. To me this a finish in that I am able to move it on to the next step and soon it will be ready to be used. 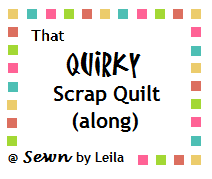 I will link up with Elm Street Quilts for the February One Monthly Goal and The Crafty Quilter for the February WIP Challenge. Thank you for the inspiration to keep checking things off on my "finish" list. I have been working on my Woodland Wonderland BOM quilt from Fig Tree Quilts. I was a bit behind schedule and decided to see what I could do to get caught up. I have quite a bit to go to complete the top but I am determined to get it done. The blocks are fun and I know that I will love this quilt but I also know it will take some effort to complete it. Setting a goal can only help me stay at it. These are just a few of the blocks I have completed, now to add fillers and follow the directions to make a complete quilt top. We are packed in to a small part of our space due to some ground water flooding in our home. It has been quite an adventure. I think I will share a few before and after pictures in another post as we go through the process of repairing and putting things back in order. Finding a spot to take a picture of my sewing is a challenge. This was taken in our dining/sewing/closet next to our living room/bedroom. Fun times. I will link this post to February One Monthly Goal at Elm Street Quilts. If I complete this project, I will also share it as my February finish on The Crafty Quilter. It is one of the projects from my UFO & WIP List. 2019 is my second year of focusing on finishes. Not that I stuck to "no starts, only finishes" last year. 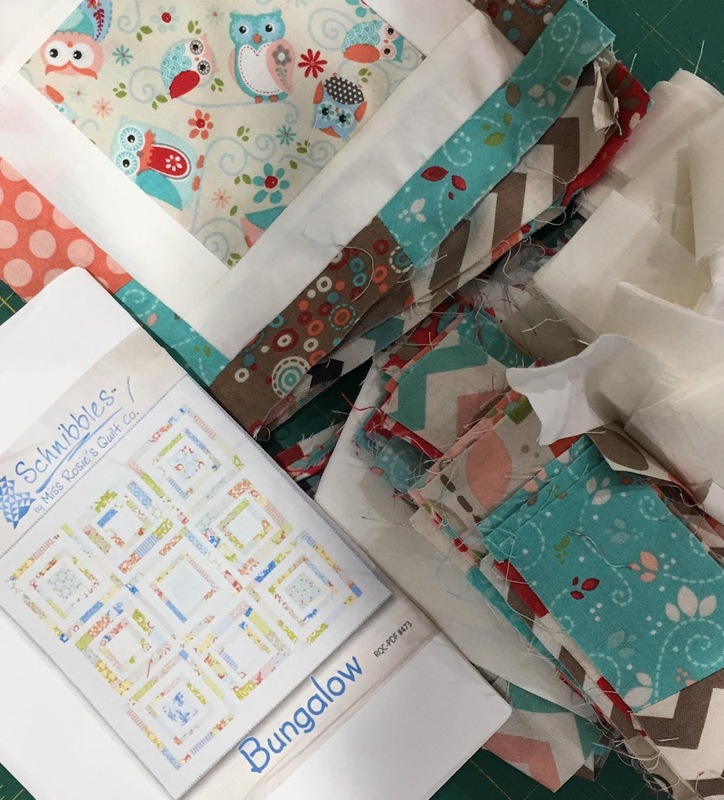 I did add several to my list to finish this year and we all know that it is just too hard to not start some new projects or join just a few sew along groups. Anyway, I am here to share my "almost finished quilt top". It is the one I chose from my very long UFO list to "complete" this month. To me this is a finish because now it is ready to send out to be quilted. The back is prepared and all is ready to go. The unique thing about this one is it is a block of the month from 2018 and it is only January and it is pieced together. I believe that is a record for me. I still have many BOM projects waiting to be completed from several years back. This is my quilt from Sherri's Block of the Month at A Quilting Life. The size of the blocks help to showcase the fabrics used. My pictures have been taken inside because I have been leaving for work in the dark and returning after dark. I am so looking forward to that changing. I will be linking with The Crafty Quilter to share my finish. Setting a goal for the month is always a great help to me, it feels great to check projects off the list and put them to use. It is time to pick out my goal for February. Looking forward to a little more daylight each day. Wow, it is hard to believe that it is 2019. So many things have happened this past year and blogging was something that I did not find much time for. We have many changes coming in the year ahead and I am looking forward to sharing more about that. My hope is that I will make the time to share projects and family events on a regular basis this year. I plan to join in and post goals and share those I am able to complete. First I will share my goal for January. The quilt blocks below are my 2018 Block of the Month blocks designed by Sherri at A Quilting Life. Twelve blocks complete and ready to be put together. I will pick up some border fabric this weekend and be ready to complete the quilt top. Thank you to Patty at Elm Street Quilts and Julie at The Crafty Quilter for their inspiration to pick a project each month and finish it. I hope to share the finished quilt top very soon. I sometimes don't realize how much time has passed between posts. I guess I have been pretty busy but I have missed blogging and keeping track of projects I work on. I wanted to share a baby quilt I recently completed. The fabric I used was sent to me by Amy at A Quilting Sheep. I have followed her blog for some time and have enjoyed getting to know her a little through her posts. She is a very generous lady. When I told her how much I liked the fabrics she was using in a project she offered to send me some of the fabric. I received a box in the mail full of fabric pieces of many different sizes. I had fun working with it and have other plans for its use in the future. This is a scrappy quilt I made for my niece, her baby is expected in October. I quilted it myself and I know I could use a lot more practice. I do know that small projects are my limit when it comes to quilting them. Next time I will add a bit more quilting. Thank you Amy for your generosity. I am working on several Block of the Month projects this year, I will share them her soon. Thank you to all who visited and commented on this post. I have been out of town so I did not choose a winner for the pincushion until today. I used the Random Number Generator to choose and the number was number 26. Tammy, you are the winner! I will email you to see where to send it. When I first heard about the Where Flowers Bloom Blog Hop at Creatin' in the Sticks I thought of a few projects I had here at home that involved flowers or fabric with flowers. I thought it was the perfect time to get started on these projects and join the hop. I was able to complete two projects. First I will share The Abbey Bag by Abbey Lane Quilts. 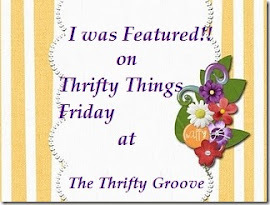 I was part of a Pincushion of the Month club a few years ago at Shabby Fabrics. This was one of the kits I had not worked on up to now. I also had time to make something to giveaway to a visitor to this post. A pincushion and thread or scrap bag is what I will use it for. I could be used to hold whatever you need close by while sewing. I had so much fun with the kit and I love the bright and cheerful fabrics. While cutting out the firs pincushion, I decided to make another pincushion to give away to one of my visitors to this post. I did not have time to make the bag with this pincushion but this flower pincushion could be a cheerful addition to any sewing space. 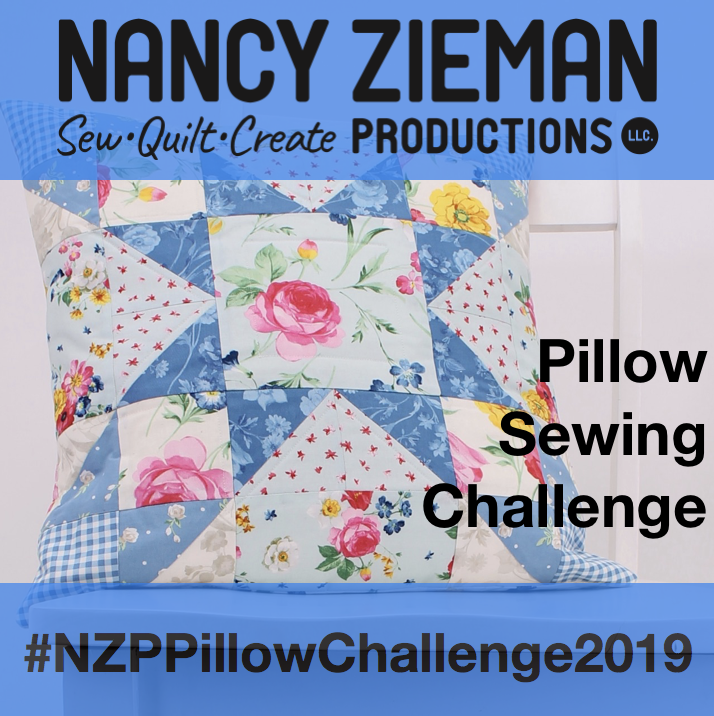 Leave a comment if you are interested in winning this pincushion, be sure to leave a way for me to contact you if you win. The other project I made was a bed runner, also made from a kit. It was fun to piece the log cabin blocks and oh so simple with pre-cut fabric pieces. It was a relaxing project and quick to complete. I did a bit of straight line quilting, I can always use the practice. I love adding striped fabric as binding. This little bed runner is brightening up our room for now. I have binding to put on the quilt that will replace it. I will have no problem finding a place to use this runner. Don't forget to leave a comment, anyone is welcome to enter to win the blue pincushion. I will choose a winner on Monday and update this post. 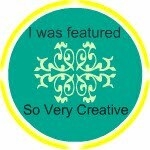 Visit the blogs above and see what they have created for the Where Flowers Bloom Blog Hop. Thou wilt keep him in perfect peace, whose mind is stayed on thee, because he trusteth in thee. I have been married to my best friend for 46 years and am mother to six children and grandma to 22 grandchildren . I love sewing, gardening, embroidery, reading, crocheting and quilting which should be on the top of my list. I love to spend time with my family and friends. I work a full time job managing a bookmobile and outreach department for a library system and my husband pastors a church, so our lives are very full. The Lord Jesus Christ brings light and joy to my life as I try to live for Him each day.